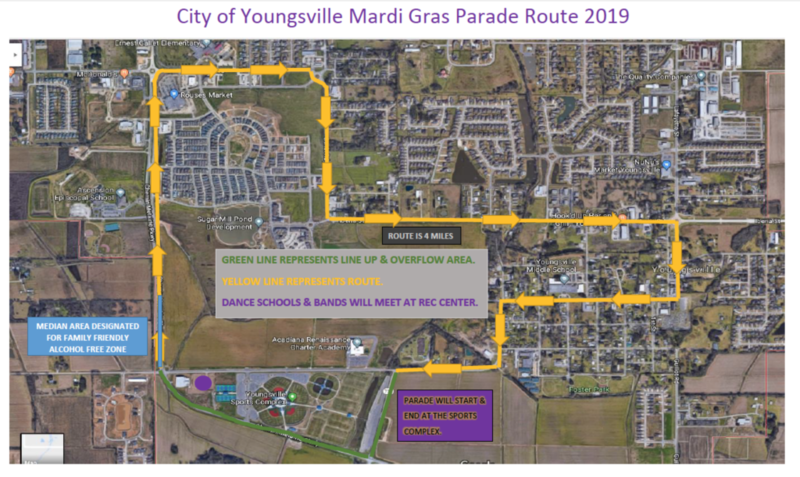 Please complete the form to apply for a permit to participate in the City of Youngsville Mardi Gras Parade. Please submit a copy of your valid drivers license when picking up your parade permit. Please submit a copy of your vehicle proof of insurance when picking up your parade permit. By attaching my signature below, I verify that I have read and will abide by the rules of behavior established by the City of Youngsville for the float/vehicle and those individuals who I permit to ride on the float/vehicle for which I am hereby authorized as a participant in the 2019 Mardi Gras Parade. My failure, or the failure of anyone participating on my vehicle/float to abide by the behavior described on the permit will result in the immediate removal of my vehicle/float from the parade. I fully understand that there will be no refunds of fees paid to the City of Youngsville for participation in the 2018 Mardi Gras Parade. Please allow 2-3 business days for processing before picking up at city hall. Please type your name below, which serves as your digital signature.